Bruno Riccio (ed.) with articles by Russel King, Paul-André Rosental, Tony Fielding, Roberto Impicciatore, Adrian Favell, Maddalena Tirabassi and Alvise del Pra’, Pier Paolo Viazzo, Francesca Alice Vianello, Selenia Marabello, Giulia Casentini. Bruno Riccio (Laurea Politics Bologna; MA DPhil Social Anthropology Sussex) is Associate Professor of Cultural Anthropology and the director of the recearch center MODI (Mobility Diversity social Inclusion) at the Department of Education Studies “G.M. Bertin” of the University of Bologna, where he teaches Cultural Anthropology and Anthropology of Migration. His research interests include West African transnational migration, co-development, citizenship, mobilitiies, diversity, Italian multiculturalism and racism. 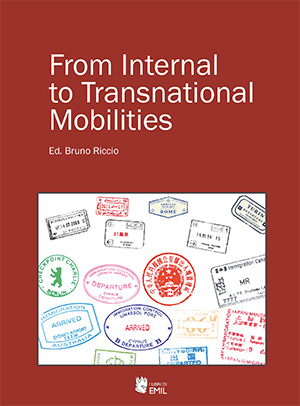 Among his recent publications one counts the following co-edited volumes: Transnational Migration and dis-located borders(2010); Disasters, Development and Humanitarian Aid (2011); Antropologia e migrazioni (2014).